Surface Gallery is pleased to announce a solo exhibition by Céline Siani Djiakoua. Deep Sea is the culmination of a three-week residency, which was awarded to Djiakoua as the Surface Gallery prize for the Nottingham Castle Open 2015. 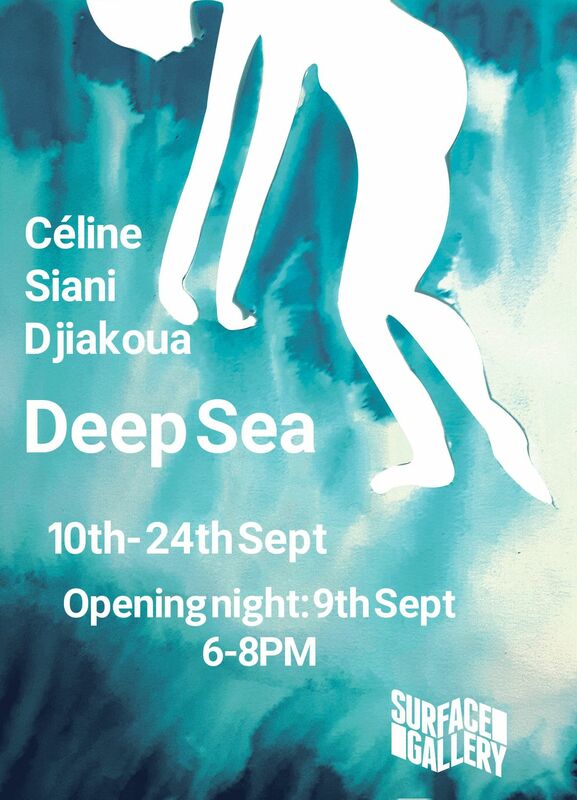 Deep Sea is a show concerned with the migrant crisis, colonisation and imperialistic values. Using large scale drawings and ink paintings, tinted fabric and sound installation, the exhibition evokes the struggles of opposing forces at work within the world. The overwhelming presence of the colour blue reminds us of the deep seas and the fluid and sensual qualities of water. The exhibition offers many levels of readings, with references to feminist French philosopher Luce Irigaray and also Jules Verne's 20,000 Leagues Under the Sea. It is a show to be experienced both sensually and intellectually. Deep Sea includes a specially commissioned sound piece by filmmaker and creative writer Ioney Smallhorne. The Opening Night features a vocal performance from Honey Williams, the director of G.O.A Choir, dubbed by Left Lion as “the biggest, baddest bunch of belters about”. There will also be a DJ set by Little Night Music Sound Services with music compiled by Stuart Hemulen. Deep Sea opens in the Project Space in conjunction with with Farhad Jafari's Zymotic Gaze in the Main Gallery. As always there will be a donations bar with ales from local brewery, Springhead.